All it takes is to simply to walk through the front door to know this is a special place and to know that you belong here. The JCC is truly a community center. Our members come from all backgrounds - old and young, families and singles, Jewish and non-Jewish, all races, and varying financial means. The JCC is a place to make new friendships, try out new activities, get in shape, learn, and simply have fun. It's a home away from home where we want each and every member to feel like part of the family. Become a member TODAY! 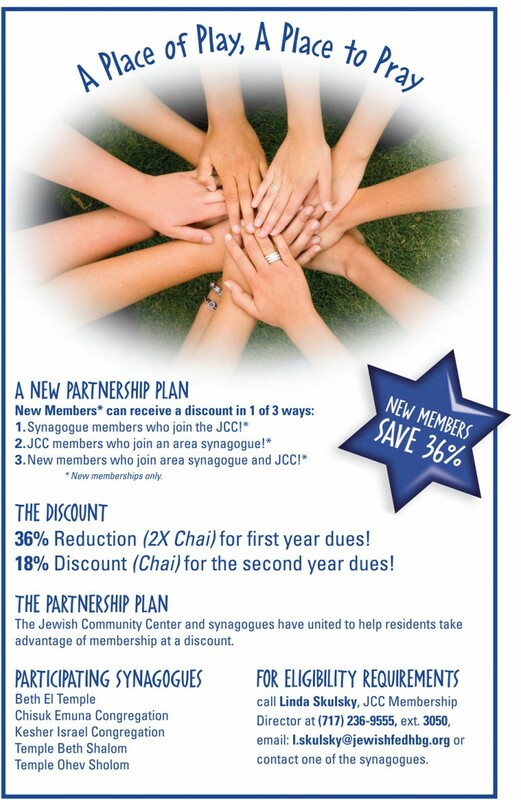 For more information on current JCC Membership pricing please contact Linda Skulsky at 717-236-9555 x3050. Completed applications may also be emailed to Linda here. I Want a FREE 2-Week Trial Pass! Learn about our Partnership Plan. The JCC and local synagogues have united to help residents take advantage of membership at special rates.